Florida's disgraced former GOP chairman says the party had meetings about "keeping blacks from voting." "In the debate over new laws meant to curb voter fraud in places like Florida, Democrats always charge that Republicans are trying to suppress the vote of liberal voting blocs like blacks and young people, while Republicans just laugh at such ludicrous and offensive accusations. That is, every Republican except for Florida’s former Republican Party chairman Jim Greer, who, scorned by his party and in deep legal trouble, blew the lid off what he claims was an effort to suppress the black vote. In a 630-page deposition recorded over two days in late May, Greer, who is on trial for corruption charges, unloaded a litany of charges against the "whack-a-do, right-wing crazies" in his party, including the effort to suppress the black vote. "In the deposition, released to the press yesterday, Greer mentioned a December 2009 meeting with party officials. "I was upset because the political consultants and staff were talking about voter suppression and keeping blacks from voting," he said, according to the Tampa Bay Times. He also said party officials discussed how "minority outreach programs were not fit for the Republican Party," according to the AP. "As Vanity Fair noted in a big 2004 story on the Sunshine State’s voting problems, 'Florida is a state with a history of disenfranchising blacks.' In the state’s notoriously botched 2000 election, the state sent a list of 50,000 alleged ex-felons to the counties, instructing them to purge those names from their rolls. But it turned out that list included 20,000 innocent people, 54 percent of whom were black, the magazine reported. Just 15 percent of the state’s population is black. There were also reports that polling stations in black neighborhoods were understaffed, leading to long lines that kept some people from voting that year. The NAACP and ACLU sued the state over that purge. A Gallup poll in December of 2000 found that 68 percent of African-Americans nationally felt black voters were less likely to have their votes counted fairly in Florida." 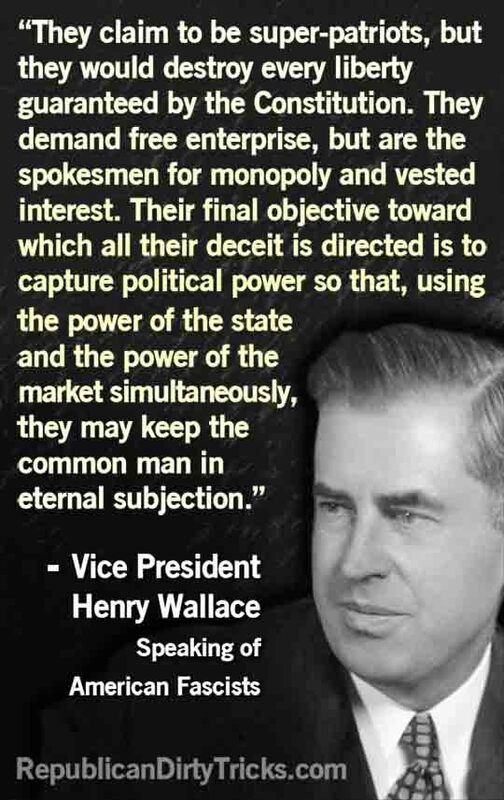 While it is no secret that Jim Crow still exists in Florida and other States - and not all of them Southern States - the true extent of Conservatives treasonous activities is never discussed by the media. 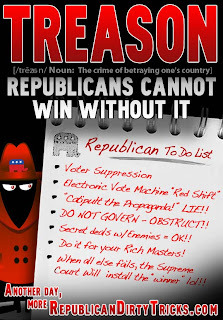 "Treason: Just Another Republican Election Strategy." 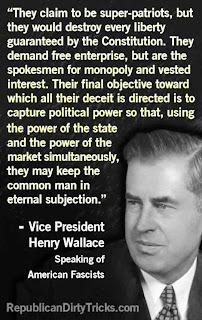 Republicandirtytricks.com begins: "Republicans cannot legitimately win elections on the basis of their failed ideology and trickle-down history of crashing the economy twice in a century, so they commit all sorts of offenses against the land they pretend to love – including lying, cheating and yes – even treason." And more, about the Conservatives beloved Ronald Reagan: "In Madrid and Paris, the representatives of Ronald Reagan and the Iranian leadership discussed the question of possibly delaying the release of 52 hostages from the staff of the U.S. Embassy in Teheran, taken hostage by Iranian "students" and members of the "Corps of Defense of the Islamic Revolution" on 4 November 1979 until after the elections that took place in November 1980. In exchange for this, the American representatives promised to supply arms to Iran. This was asserted, in particular, by a former Israeli intelligence agent, Ari Ben-Menash, a Jew born in Iran and arrested in 1989 in the U.S. for supplying arms to Iran (arrested in California on charges of exporting contraband C-130 aircraft from the U.S. to Iran and who was in prison for 11 months and then freed). According to his calculation, the total value of the arms illegally delivered to Iran reached 82 billion dollars." The article concludes, "These traitorous, treasonous, actions point to the fact that if we are ever to restore America to greatness, the Republican Party should be relegated to permanent minority status – as it was during the 50 years of United States history known as "The Great Prosperity." 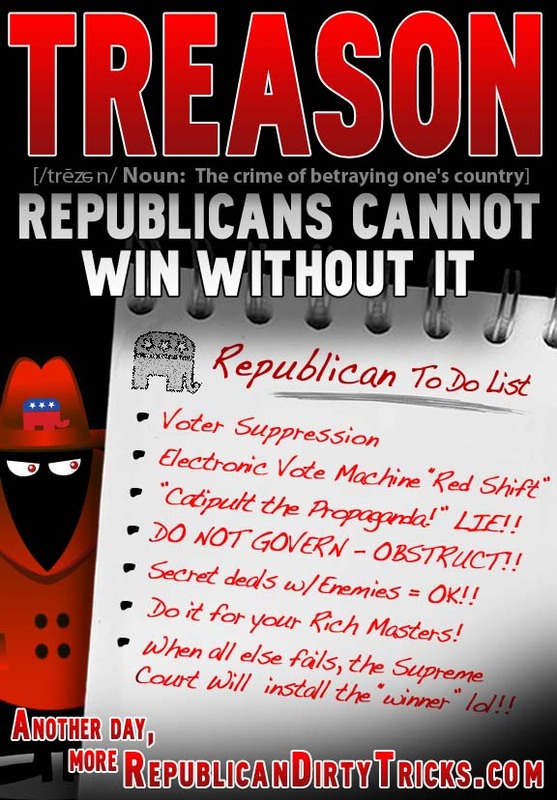 Substitute the word "Conservative" for "Republican Party," and "illegality" for "permanent minority status" and you have the theme of "Criminalize Conservatism," cheerfully admitteby this poster to be composed by a web site with more expertise than this poster could ever hope to achieve. Our country will be relegated to a Third World Status until the treasonous Conservative movement is marginalized, then criminalized. I think this is a very provocative, and very relevant post, but I would suggest just one change- in the paragraph above, you claim 5 presidents since Eisenhower- do you not mean "5 GOP presidents"? That was my assumption, and I know it's kind of nitpicking, but we have to keep our facts straight to make sure the bad guys can't muddy the water any further. Thanks for the compliment and comment. I also noticed the use of "5 different presidents" by the Republicandirtytricks.com article and thought about parenthesizing "GOP" or "Republican," but let it stand out of admiration for the whole piece. And, after all, there couldn't be too much confusion by the bad guys if they bothered to watch the Thom Hartmann video.